Childhood rigging was easy. Someone else always did it for me. As I grew into young adulthood I remember having a certain insecurity when it came to fishing. I never knew which kind of a rig or setup to use. In those days there was no internet to quickly look up information. I surely wasn’t going to waste a trip to the library when I could be spending that time fishing! Alabama Rig Fishing wasn’t on my radar at that time but I wish someone had shown it to me. I’d of had a much better time fishing (and been a bit less insecure about it) if I’d have learned it. 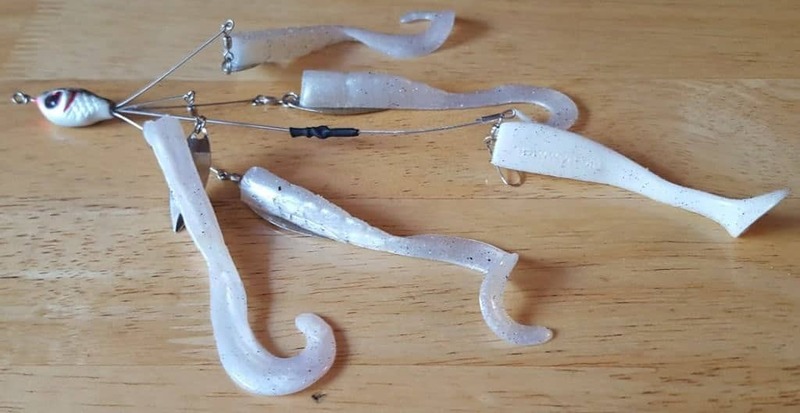 Alabama Rig Fishing (aka the umbrella rig) took the concept of fishing a single imitation bait and asked the question, “Why do you have to use only 1 lure when trolling or jigging?” The Alabama Rig is a contraption that starts with a swivel. The fisherman’s main line is easily tied to one end of the swivel. The umbrella effect begins at the other end of the swivel. From here several wire lines spread out. These can range in number from 4-8 in basic models, to complicated variations that have multiple cascading wires. Each wire ends with either a hook or a ring designed to easily place plastic swimbaits or any other type of lure desired. Some models will come ready to go while others are sold just as rigs allowing you to choose which lures to apply. Many tinkering types also like to build their own Alabama Rigs! 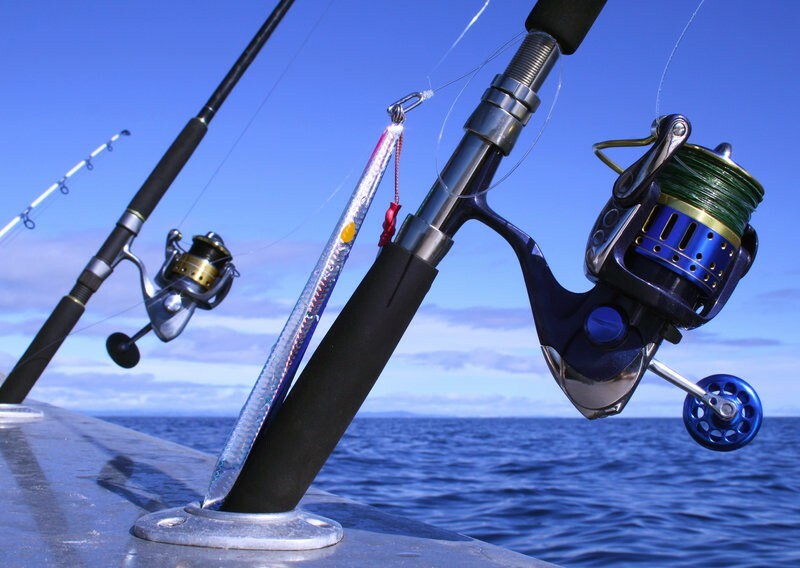 Alabama Rig Fishing has been well known to New Jersey saltwater fisherman for quite some time. Whoever first thought up its design may be uncredited, but we get our first reports of the A-rig being commonly used from those tough Jersey fishermen. It wasn’t until 2011 that the umbrella rig made a big splash in bass fishing circuit! The Alabama Rig has had quite a journey of success, criticism, bannings, and hook sets since its rise in popularity. The very appearance of the Alabama Rig gives away its obvious advantage. What predatory fish wouldn’t be attracted to a small school of fish swimming slowly through their zone? Umbrella style rigs present as a larger target in the water making them much easier to see than a single fish lure. Multiple jig lures also offer a larger meal to hungry fish which also adds to their attraction in the water. The sound of the contraption itself is intensified compared to any single fish lure. Tying your main line to your A-rig will be the easy part. Simply pick your best knot and make sure you snug it down tight to the swivel. Ensuring your Alabama Rig functions properly in the water is the matter of most concern. Here’s a few points to keep your rig working as it should when you need it. Keep Your Rig Properly Stored – Alabama Rigs work best when the wires aren’t bent and twisted around each other a dozen times. Make use of small rubber bands or zip ties to keep your rig secured tightly together. Then store it in a place protected from impact. Inspect Your Rig Before Use – Take a close look at your Alabama Rig when you remove the bands or ties you’ve used to secure it. Take this time to get the rig straightened out, checking for any damage to wires or components as you go. 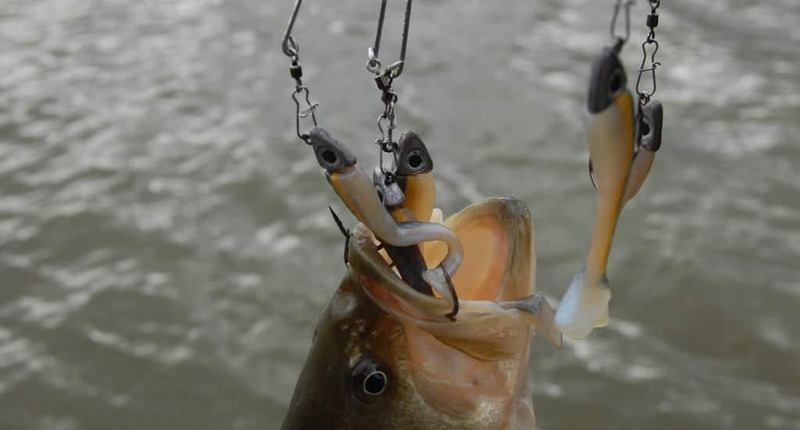 Use Similar Baits And Similar Weights – Keeping these two rules in mind will accomplish 2 things. First, keeping your lures all within a similar size and appearance will make your school look much more natural in the water. Like fish swim together. Second, keeping each lure the same weight will provide an even swim in the water. If you have different weights on your rig the heaviest one will pull. This can twist and tangle your rig in the water. These are some real basic yet extremely important pointers for using the Alabama Fishing Rig. I suggest having a few different rigs available. 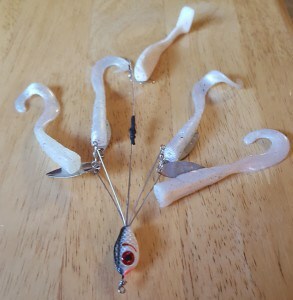 This way you can change the weight or lure type easily by simply tying to a completely different rig. Much easier than trying to change out all the lures on one Alabama Rig each time you want to try something different. Cold water conditions often found in late fall, winter, or early spring tend to keep fish a bit slower on the take. These are the times that using the Alabama Rig is most often mentioned, and often most effective. Getting a multiple lured rig down deep and presenting it with a slow retrieve just off the bottom can often produce strikes that would otherwise never happen. Alabama Rig Fishing has been proven to be an effective means of luring fish and landing the catch. That being said, this multi lured rig doesn’t come without its drawbacks. 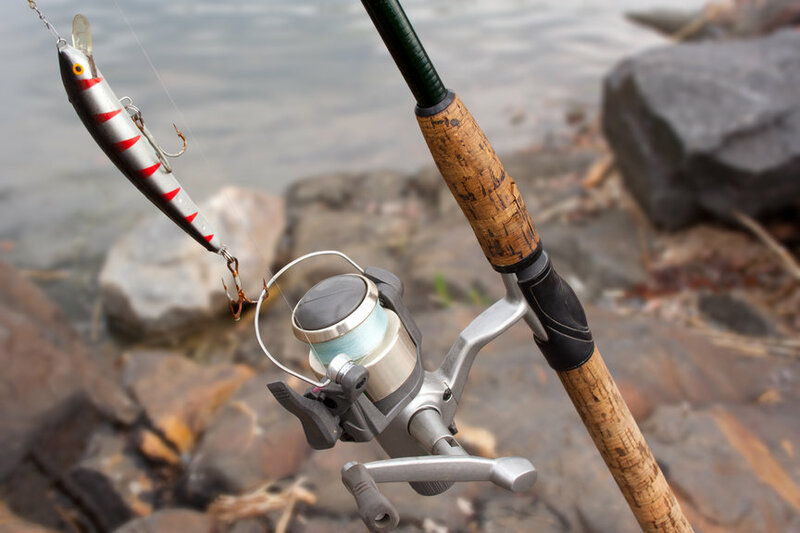 Besides having a bad rap for making fishing a little “too easy” within certain fishing circles, the rig also has practical limitations. Alabama Rig Fishing has been banned in many waterways. Be very sure to know all the regulations for whatever specific area you end up fishing. It isn’t rare for larger fish to engulf more than one lure with a single strike. This is great for hook set, but it’s not so good when any pursuant lures foul hook the fish. If you were planning on releasing that fish a foul hook greatly reduces its chances of survival. If on the other hand you’re fishing the ocean and planning on keeping your catch for consumption, foul hooks aren’t as big of a concern. The Alabama Rig may be an effective means of luring fish, but there definitely can be mixed emotions about its use. Our doors here are always open to your opinion on such matters, and we’re always listening. I personally like their effectiveness, but find I’m a bit clumsy in their use. What do you think? Like our Alabama Rig (umbrella rig) Review? Please leave your feedback and comments.